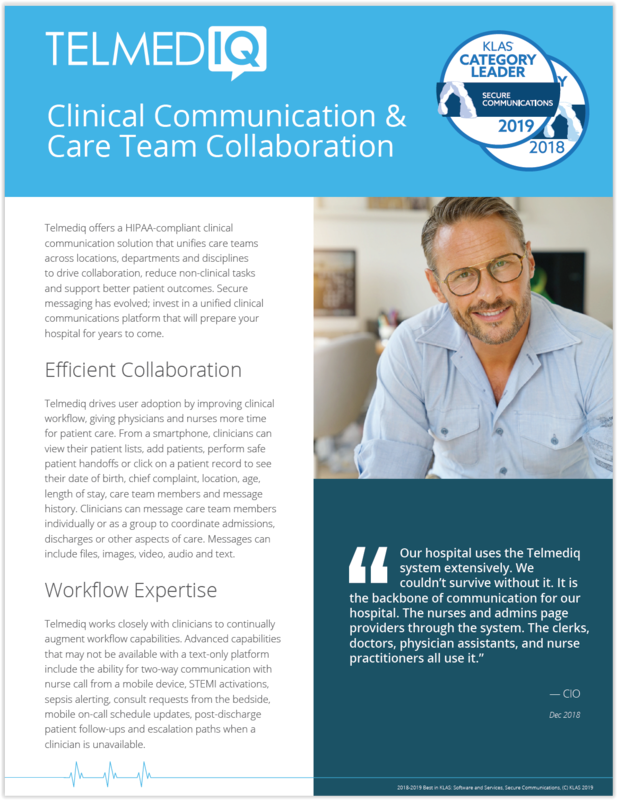 Telmediq offers a HIPAA-compliant clinical communication solution that unifies care teams across locations, departments and disciplines to drive collaboration, reduce non-clinical tasks and support better patient outcomes. 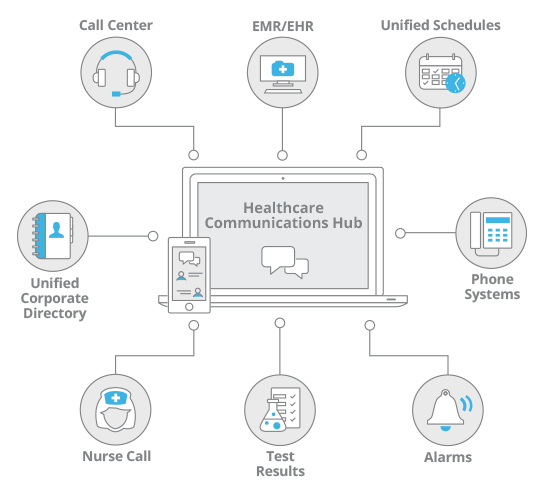 Secure messaging has evolved; invest in a unified clinical communications platform that will prepare your hospital for years to come. 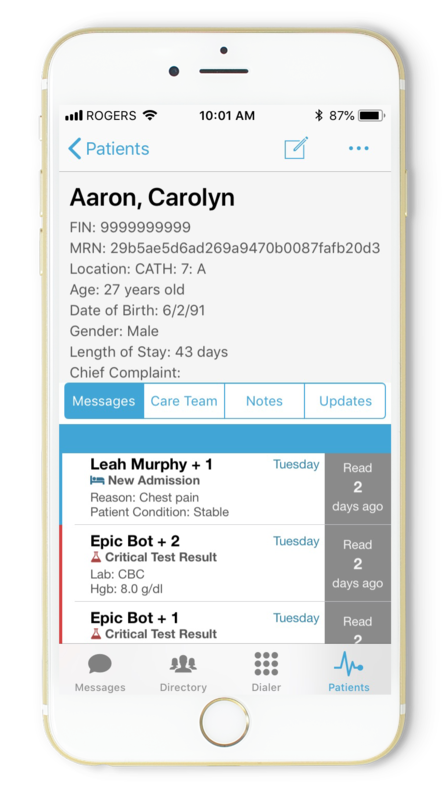 From a smartphone, clinicians can view their patient lists, add patients, perform safe patient hand-offs or click on a patient record to see their date of birth, chief complaint, location, age, length of stay, care team members and message history. 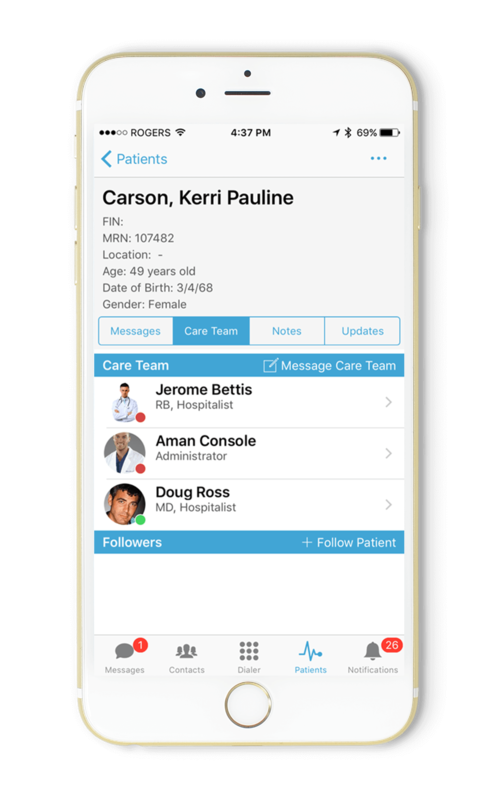 Clinicians can message care team members individually or as a group to coordinate admissions, discharges or other aspects of care. Messages can include files, images, video, audio and text. Hospitals often struggle to drive these workflow benefits as a result of technology silos. Telmediq can reduce costs and support requirements by replacing legacy technology and unifying current systems as part of the transition to a cloud-based solution. 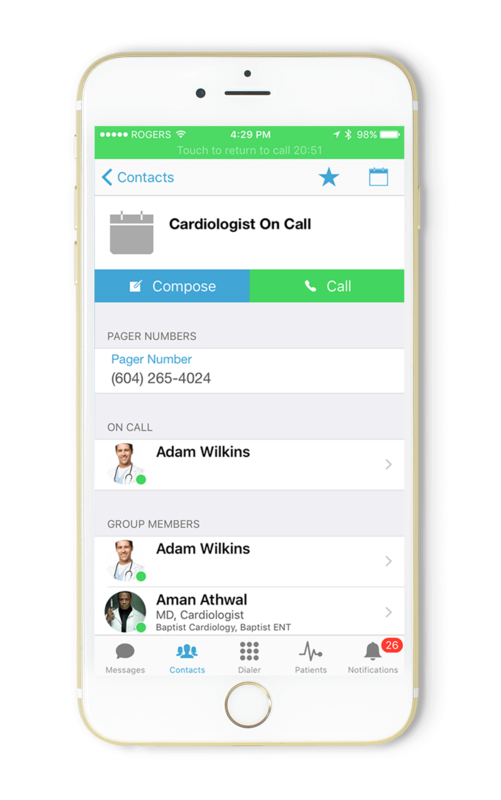 Telmediq supports key integrations with the EMR, schedules, middleware, the call center, nurse call, telephony, pagers and directories. To reduce your vendor footprint, Telmediq offers its own cloud-based solutions for patient engagement, AI-driven scheduling, pager functionality, telephony and the call center. For healthcare organizations that span several locations, or that have varied solutions among departments, the unification of scheduling solutions and the clinicial directory is essential to drive value for clinicians. 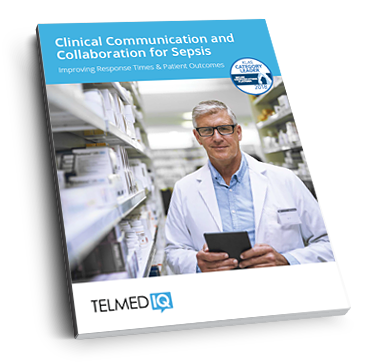 For nurses, Telmediq bundles both the software and the hardware into one mobility strategy that addresses critical concerns over shared devices, sanitation and non-clinical task automation. 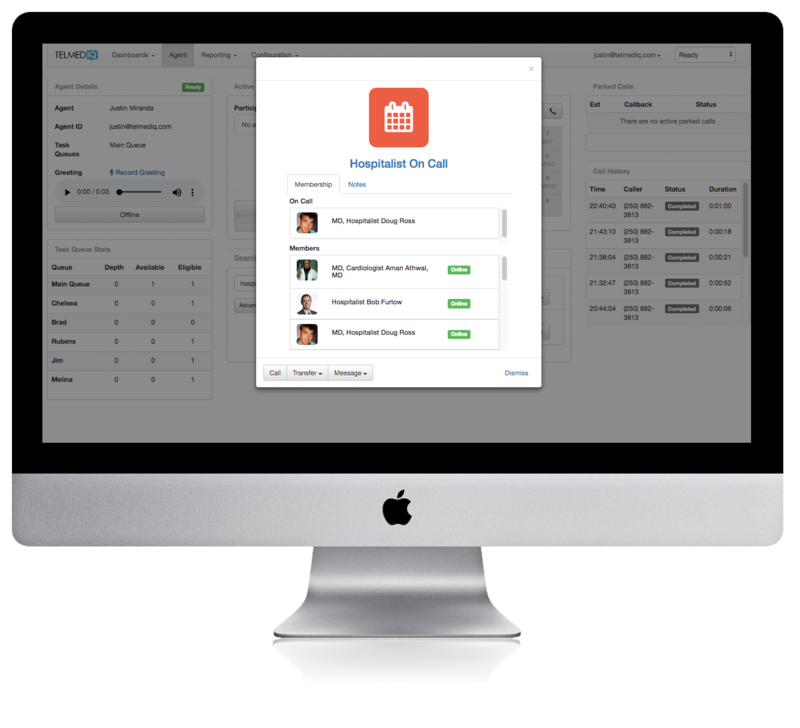 Unifying the clinical directory and on-call schedules allows clinicians to find care team members by name, role (such as “Hospitalist On Call”), location, department, group, speciality or title. Differentiated alerts ensure that urgent communication can be addressed immediately, and that non-urgent messages don’t interrupt treatment of another patient. Rules-based messaging routes communications based on preferred workflows, time of day, vacation schedules and even last-minute shift changes, with all messages having sent, delivered & read notifications. 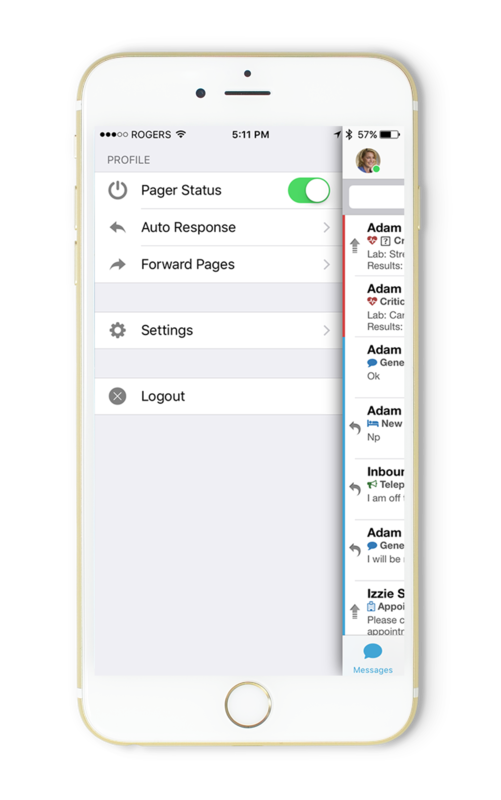 Physicians want to retain pager functionality, such as the ability to have another clinician monitor incoming messages while in surgery or in a critical patient encounter, but benefit from enhanced paging functionality. 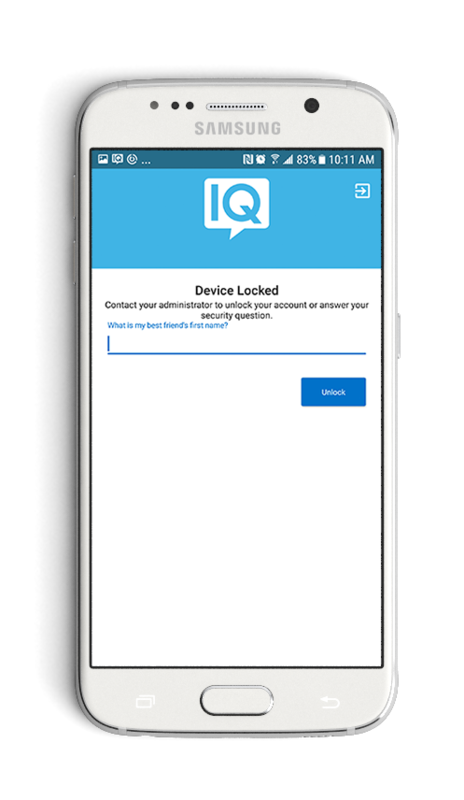 Telmediq allows physicians to use their smartphone as a paging device but adds two-way communication, escalations when unavailable, and the ability to block personal numbers for patient communication. The call center console allows agents to handle inbound calls and have access to critical information from clinical and IT systems in real-time using a unified interface. Agents can join virtual queues from any location to service inbound patient and clinician calls, and instantly contact clinicians via park & page, phone or secure message. Telmediq is HIPAA compliant and ISO 27001 certified, offering health systems the highest level of security to safeguard patient health information. Protect your organization with features such as advanced authentication, message lifespan, audit history, PIN protection, and remote lock and wipe.